This Dionaea muscipula 'Werewulf Ara' is a real new plant from Araflora. It is a stable clone of a new venus flytrap clone we did develop last years. It does like like the werewulf clone and to make it different we did put Ara in so we decided to call it Dionaea muscipula 'Werewulf Ara'. 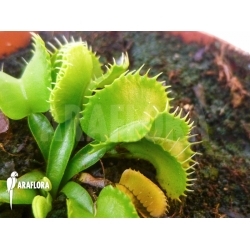 We do not sell this year but you can pregister with the out of stock option for this unigue araflora Venus Flytrap clone.